Who are the Top Five Universities in Ireland? Ireland, a neighbouring country of the United Kingdom, is one of the wealthiest countries in the OECD (Organisation for Economic Co-operation and Development) and, over the last few years, it has emerged as a preferred destination for international students. Despite its size, Irish universities are ranked amongst the best in the world and studying in Ireland, for European students, also means the free fees scheme, enabling those who meet the criteria to avoid tuition fees if studying a publically funded course. For international students, there a huge variety of scholarships, grants and bursaries to help fund your studies in this beautiful country. 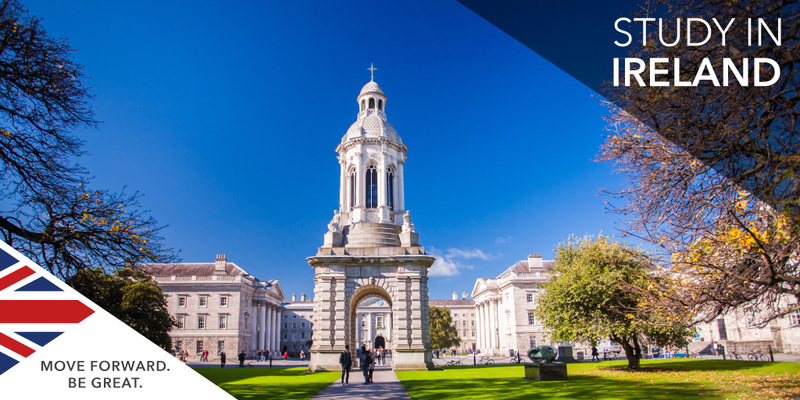 Learn more about the best five universities in Ireland below and arrange a free consultation at our offices to get your application started. Trinity College Dublin is one of the oldest universities in the world, founded in 1592. It offers a unique opportunity for students to blend academic excellence with cultural and social activities, equipping graduates with the skills and knowledge required to succeed. Ranked as the best university in Ireland in the THE World University rankings, Trinity is also 88th in the world in the QS World University Rankings. The National University of Ireland Galway (NUI Galway) is located on the western coast of Ireland and was founded in 1845. 17,000 students are currently enrolled, 2,000 of which are international, and NUI Galway is ranked in the top 2% of universities worldwide for the quality of its teaching and research. More commonly known as UCD, University College Dublin is ranked among the top 1% universities in the world and is currently ranked 168th in the QS World University Rankings. University College Dublin's 'UCD Michael Smurfit Graduate Business School' is one of the best business schools in the world, offering an MBA which is ranked 70th globally and 25th in the European Business School rankings. Founded in 1845, University College Cork is part of the three Queen's Colleges. The University has been named Irish university of the year five times and it offers over 120 degrees in humanities, business, law, architecture, science, food and nutritional sciences, medicine, dentistry, pharmacy, nursing and the clinical therapies. Dublin City University (DCU) is a young university, situated on an 85-acre campus three miles north of the River Liffey in the city centre and just a 15-minute drive from Dublin airport. DCU's business school and engineering and computing department are amongst the best in Ireland and offer programmes in every field. If you are you interested in applying to study in Ireland, arrange a free consultation today! We can help you decide on your perfect Irish study location and help you apply for foundation, undergraduate and postgraduate courses.